Its 2018 and its a long overdue performance upgrade from the 1999 HTTP 1.0 and 1.1 Specs. Its promise is to reduce the perceived load time in user perspective and also have more efficient use of server and network usage. So lets try out and see if we could have more optimized results on one of my development environment. 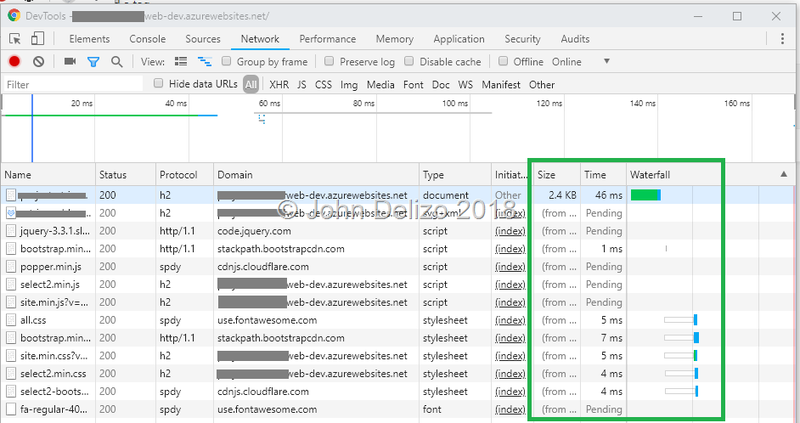 The test would be using a single website, cache disabled using Chrome so that we could have a measuring tool for performance. We would perform two tests, before and after we turn-on the HTTP/2 version on our web servers. Response time results: HTTP/2 Performs better in returning individual resources from the server. 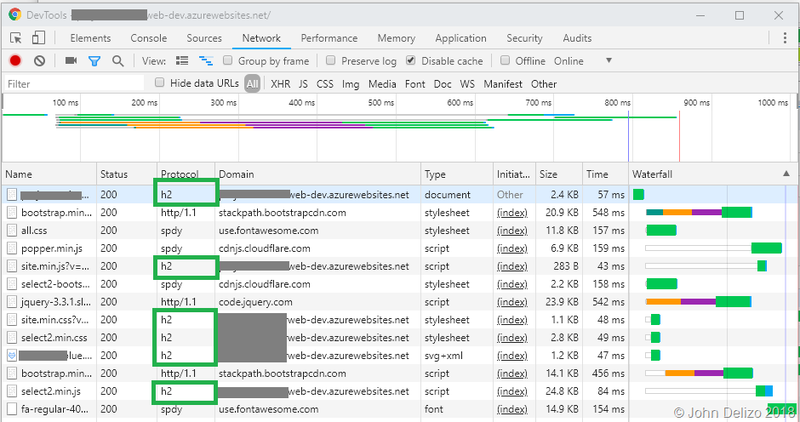 Size results: HTTP/2 Do compress the content, this shows that files served thru HTTP/2 is lower in size. How did I enable HTTP/2. 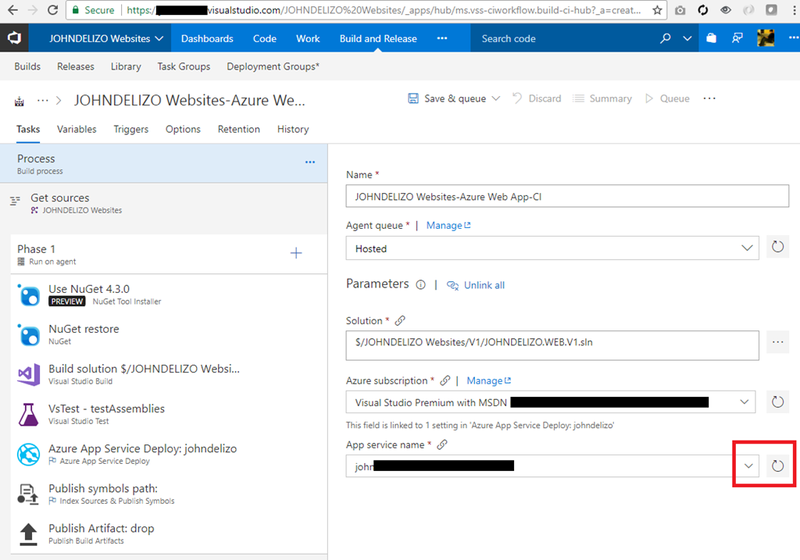 This site is hosted in Azure as an app service. To enable, search for the HTTP version on the Application Settings. Click save and refresh. 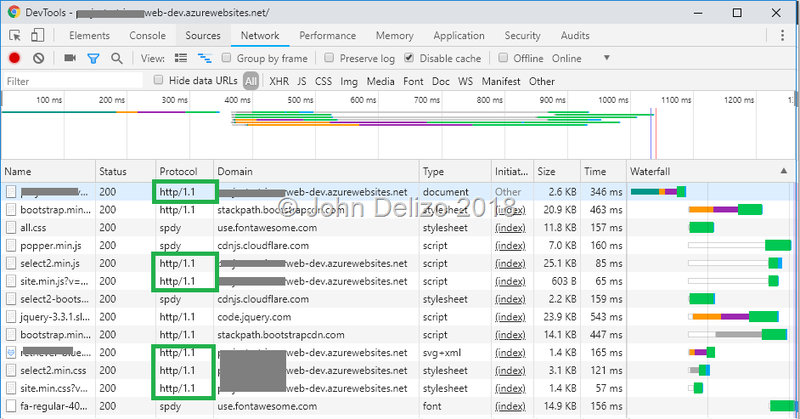 For the on-premise-premise, HTTP/2 is also available on Windows Server 2016/IIS 10 and Windows 10. 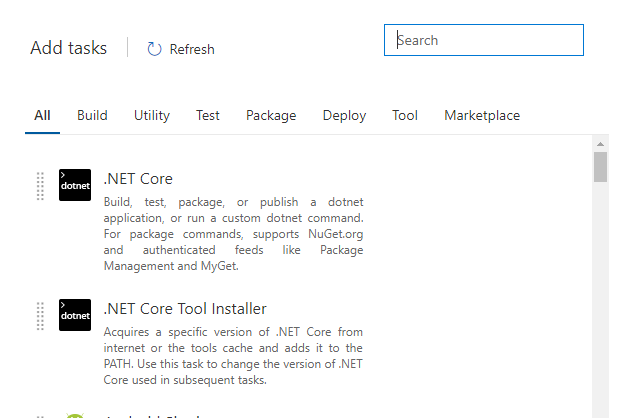 So .NET Core 2.1 RC is out. With its Go Live Support I am fairly confident that I could upgrade my super secret project. Upgrading my projects was easy. 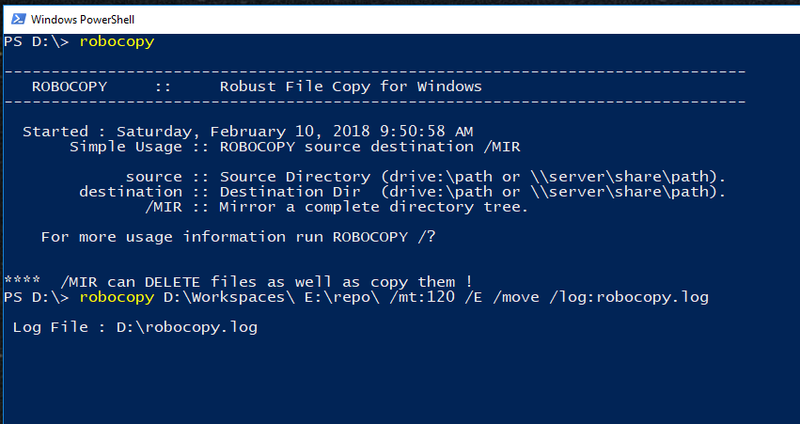 I download and installed the 2.1.300-RC1 from https://www.microsoft.com/net/download/dotnet-core/sdk-2.1.300-rc1 and for VS2017 it should also show on your notifications window by the way. Once my tools are upgraded I then did some minor changes on all of my CSPROJ. Make sure that the target framework is 2.1 and the Package Reference version is 2.1.0-rc1-final. Rebuild and viola, .NET Core 2.1. Here’s an example of one of my API’s. So now for the harder part. 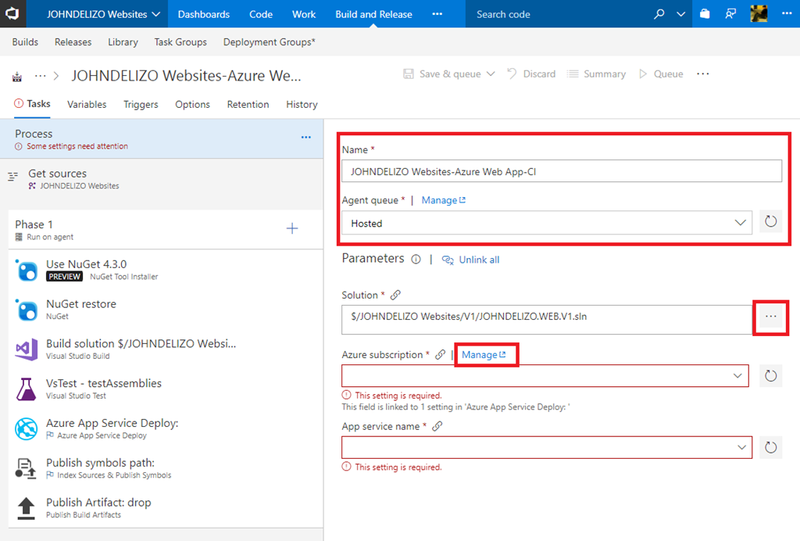 I saw from a blog post that Azure App Service will start deploying 2.1 RC next week. 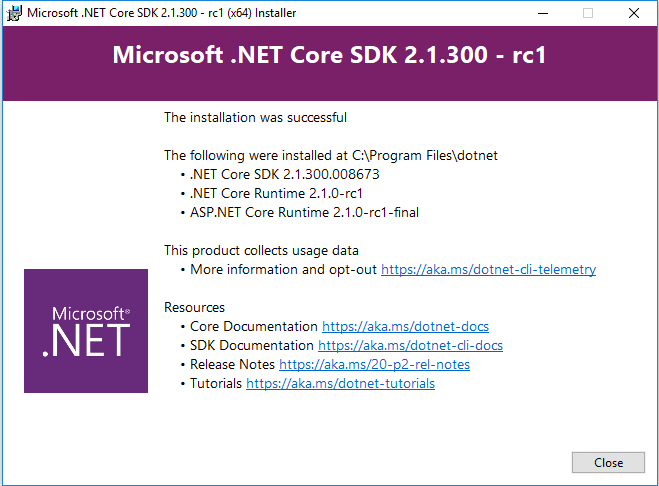 But the the impatient me, went ahead used the .NET Core Tool Installer. Broke my build saying that the .NET Core Package name is wrong. But I saw this GitHub Issue thread that says use “To use 2.1.0-RC -> to download SDK, use “2.1.300-rc1-008673”. And to download runtime, use “2.1.0-rc1”. 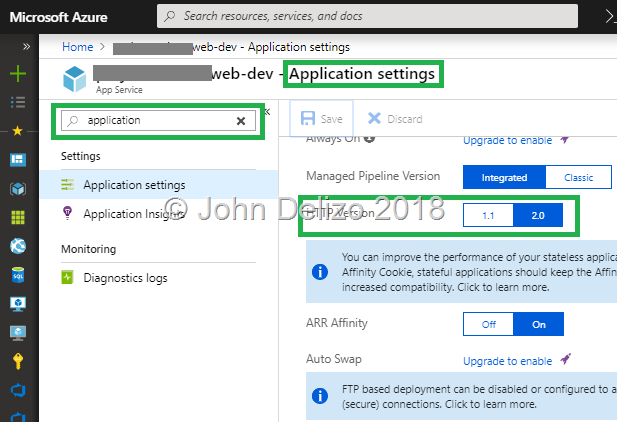 Using UseHttpsRedirection and HTTPClient Extensions! 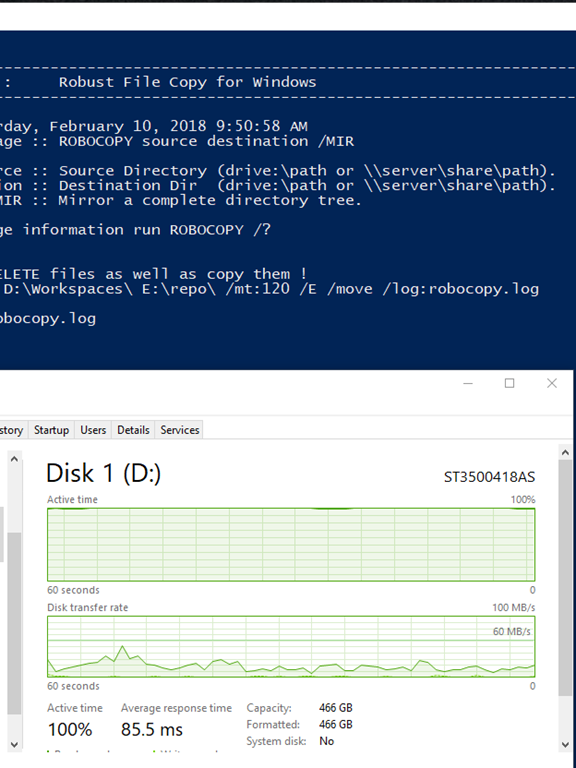 Hey this would be a quick post or even a micro post about a new feature in Hyper-V called RemoteFX 3D Video Adapter that was just shipped out with Windows 10 and WS2016. 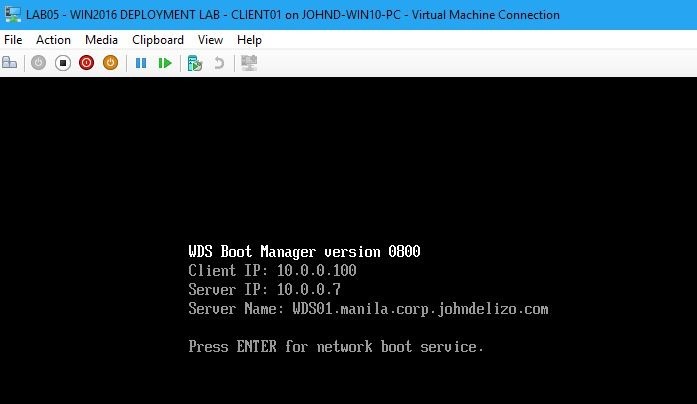 So I was doing a lab work for a Windows 2016 deployment and found new features such as the Remote FX. It seems that I can already share my desktop GPU to my Hyper-V guest! Cool! I have already alot of use cases in my mind, like running my supervised learning ai on my Hyper-V. I just need to install Unity and VS on a VM, play around there so that my PC and Mac is not always maxed out (will try to constrain it now to a 4gb memory so that I could work while waiting for the operations to complete). Anyway, back to this lab. Yes folks, still using ol’reliable WDS. Currently OOF with only an IPhone. So while waiting here, I was browsing apps and checked out of curiousity if there is a mobile app for Azure. Downloaded this and signed in using my live account. This will open a new web view pop-up. After logging in you will be redirected to your home page. I can also filter my services. Hamburger menu opens your profile and will display your directories with subscriptions. Heres a sample of the app insights for one of my web app. This is so cool this app goes into my first screen. So thats it for now! Coolness! Recently I have walked the talk and have moved my personal site to HTTPS. Although I have already moved, redirected and configured many many web front end to use SSL, I haven’t got around to implement this to my own websites. In comparison, my site is not a transactional site or doing any registration – I only use this as my portfolio site as well as a live test environment where I can experiment, learn, validate and do pretty much everything without any impact to anyone but me. There are a lot of articles here, here, here, here, here and there regarding the pros and cons of having a site over HTTPS. Basically from what I am reading now is it has an additional cost and additional load but it has to be done. Install PFX to your website. 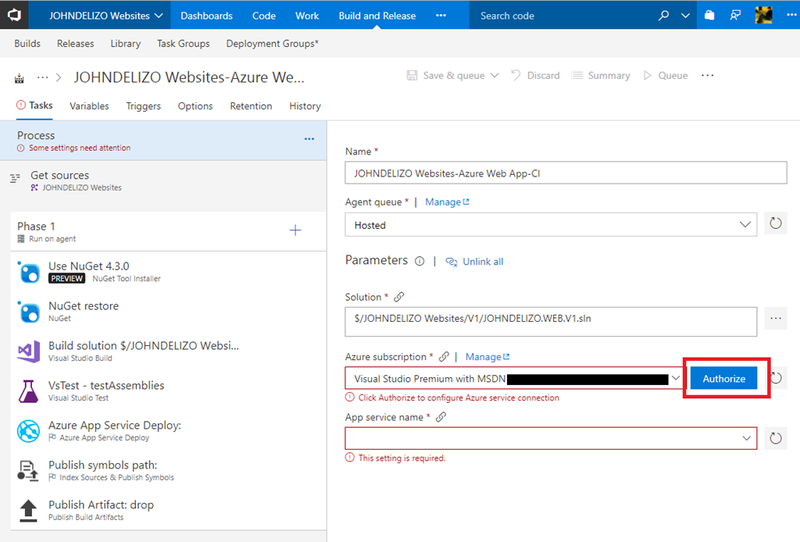 – Azure Website Basic Tier and Above. So here’s my contribution to the secure modern web! Happy SSL! 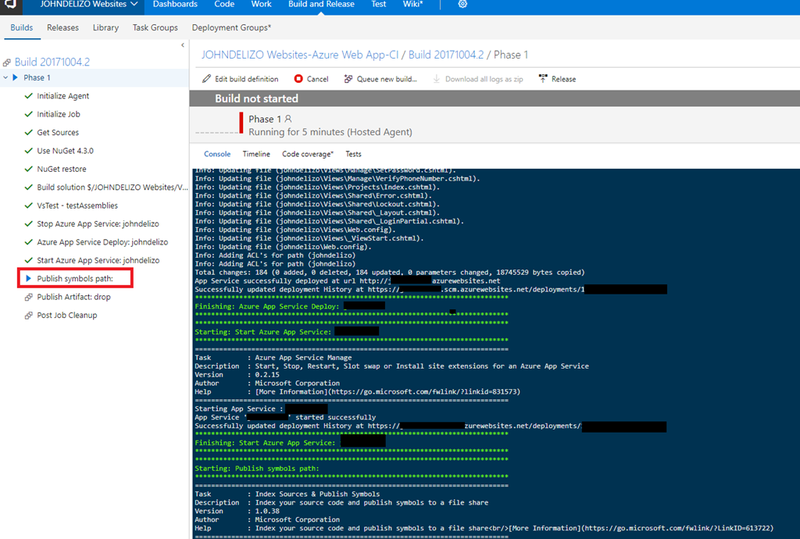 “We deprecated the hosted XAML build controller on July 1st 2017. We recommend that you migrate to our new build system. However if you still need to run XAML builds during the migration then you must set up a private XAML build controller now”. Yes yes. I forgot to upgrade. Lets move on. 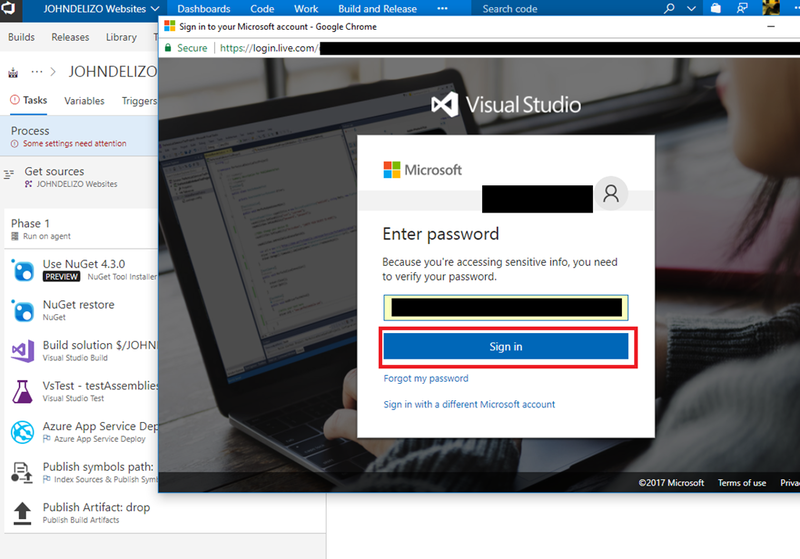 So in order to do publish, we just need to login to our visualstudio.com account and go to the project that we need to publish. 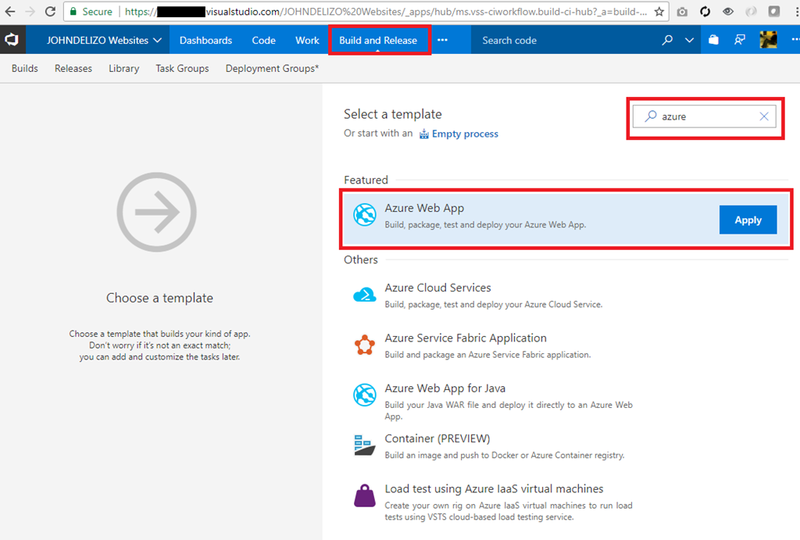 There is a tab called Build and Release, and there should be an Azure web app template. Once applied, you need to first choose which Solution to build and deploy, kinda like WEBDEPLOY before. 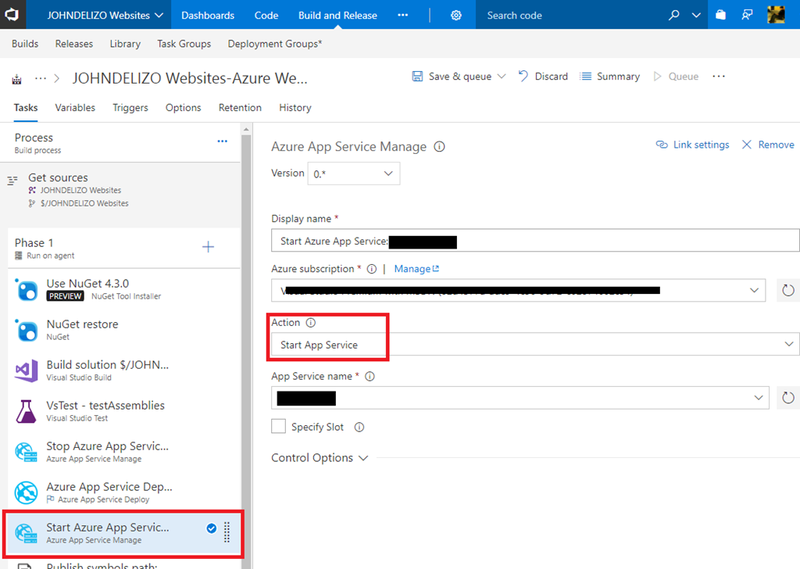 Then we need to link our azure account and then choose which app service to deploy on. 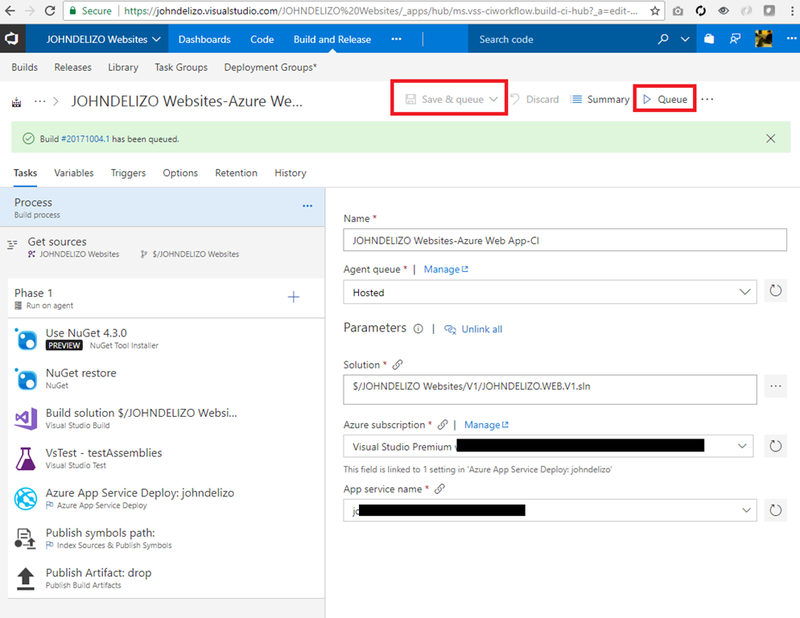 The link happens when you authorize your visual studio by logging in to your azure account. Note that this is a pop-up. Then click refresh if you dont see your app service on drop-down. Then viola, you can now save or save and then already queue for deployment. 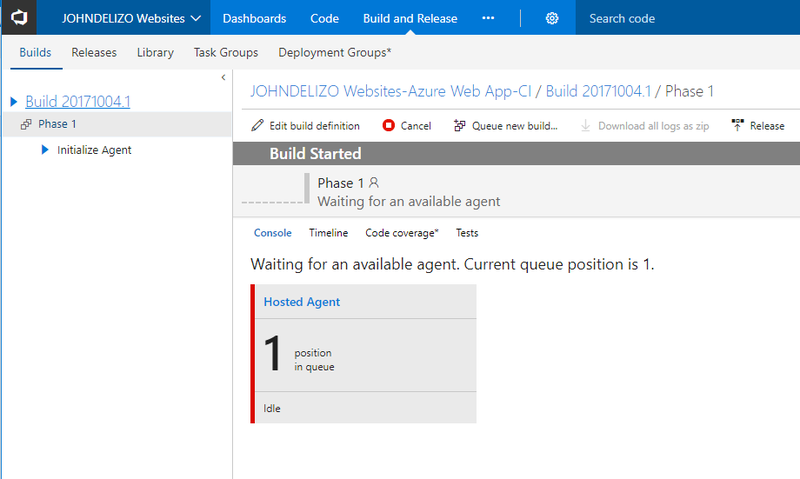 This should queue up and warm up an available agent again, like WEBDEPLOY before. Once the Agent fires-up the deployment, you will notice that the scripting engine and console is going to be shown and you will see the progress of this. Aha! You are still using WEBDEPLOY! Long live web deploy! NOOOOOOO! Okay, new Relic is giving me a bump. 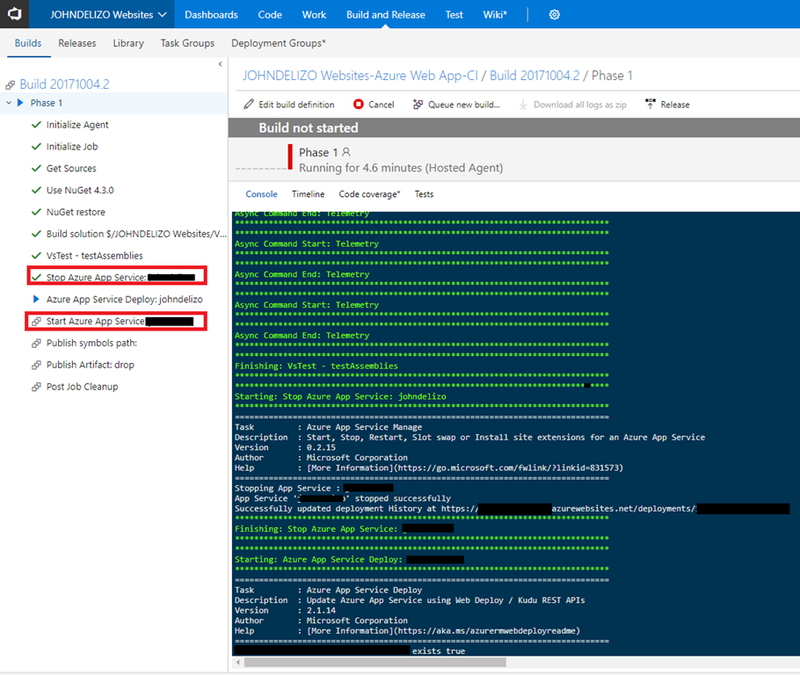 Like the old WEBDEPLOY, file is in used so therefore you cant override and your deployment task will fail. Or we could just easily do a slot deployment and switch slots after . I just remembered that I am on B1 tier in Azure. There is no slot deployment for that! Great. I remembered, this is my PERSONAL site, no one visits this or any use of this. Lets just stop the site. 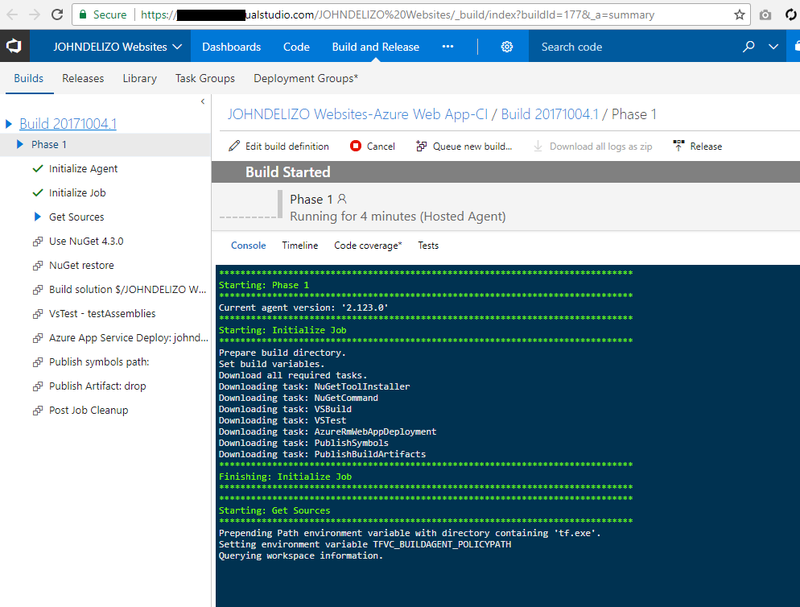 So lets do this, lets insert two deployment task in the build definition. One to stop and one to start, effectively a sandwich before and after deployment. 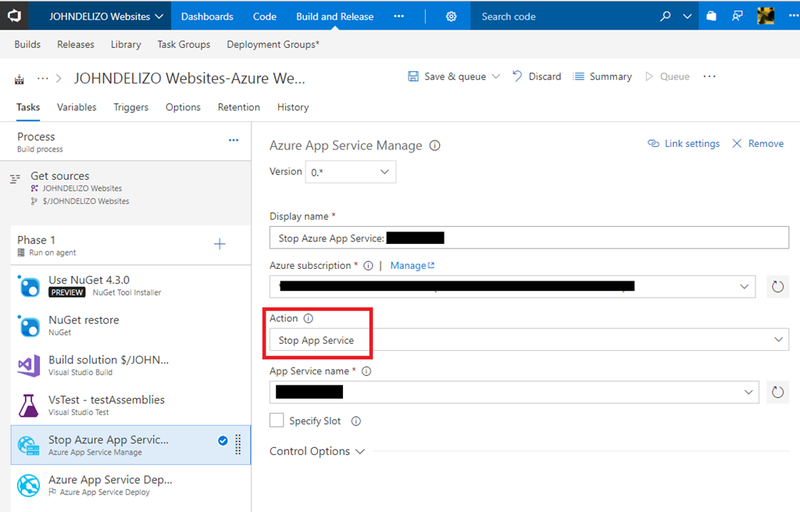 So add an Azure App Service Manager task. The first one, stop the App Service. You know which subscription and app service to stop. 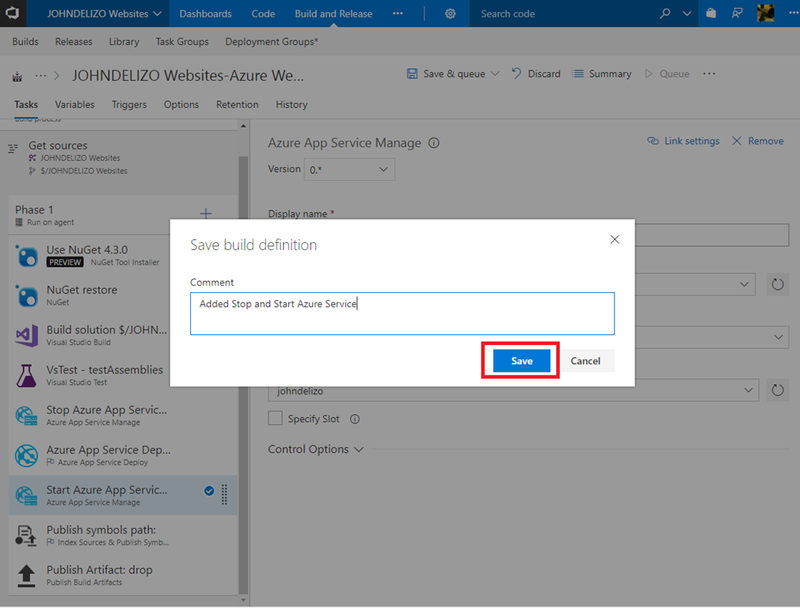 After the Azure Service Deployment task, we should start the service. Lets try it out, save the build definition and queue build! Build says its okay and was deployed successfully. 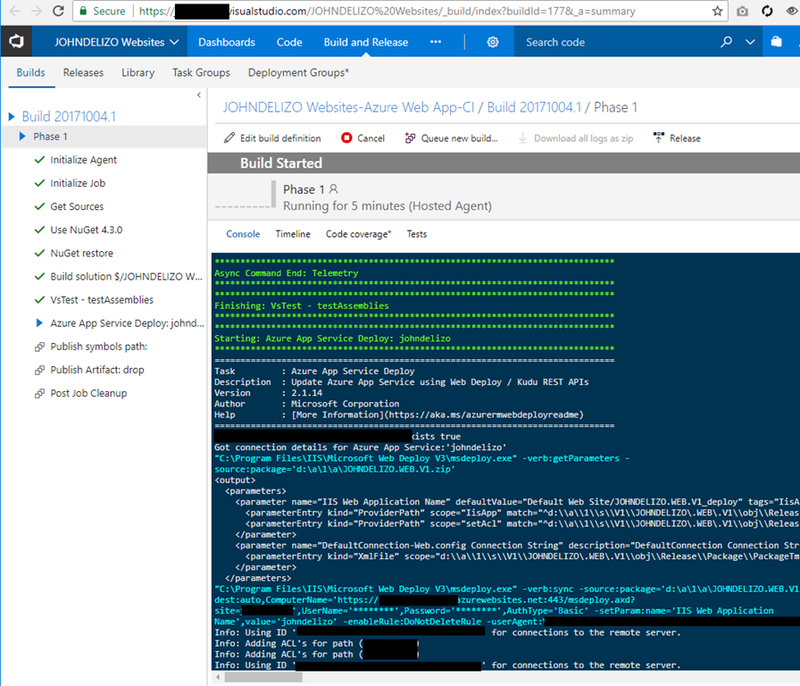 This got me thinking, we are really in the cloud already and from requesting certificates to installation, scaling my application and even a source code rebuild-test-deploy that I haven’t touched not a single MMC or any server directly.